Department of Environmental Protection Commissioner Bob Martin, Newark Mayor Ras Baraka and Essex County Executive Joseph DiVincenzo announced the completion of the third phase of the park’s ongoing development during ceremonies attended by community leaders and city residents. The project is the result of a partnership among the city, the nonprofit Trust for Public Land and the Essex County Parks Department. The $6 million third phase, which includes environmental remediation, expands the park’s size by four acres, connecting the first and second phases of the park. Together, these three phases of the park now encompass 20 acres along a mile of riverfront. The first phase of the park, spanning Chapel Street to Oxford Street, opened in June 2012, following two years of construction. The second phase, from Oxford Street to Van Buren Street, opened in July 2013. The latest phase of the Riverfront Park project includes extensions of pathways for cyclists, walkers, and joggers, scenic river overlook areas, and a wellness trail connecting the park to the city’s Ironbound neighborhood and downtown Newark that was sponsored by the Horizon Foundation of New Jersey. The park also includes flood resiliency features. “The Christie Administration is committed to preserving our open space and ensuring ample access to our waterways, which are key to urban revitalization. The Christie Administration is proud to have played an integral part in the ongoing development of Riverfront Park as part of a multi-phased effort to develop a stretch of the Passaic River into a world-class urban park for the benefit and enjoyment of the people who live, work, and visit here. Through the park’s three construction phases, the DEP has already allocated nearly $12.4 million in funding from its Green Acres, Natural Resource Damage (NRD), and Hazardous Discharge Site Remediation Fund (HDSRF) programs. In the next three phases, scheduled to begin next year, the DEP will provide additional NRD money to help bring the park to its full projected size of 40 acres, while bringing more recreational amenities to enhance the park experience. The DEP has worked collaboratively with the city, county government, and groups such as The Trust for Public Land, Ironbound Community Corporation, Newark Riverfront Revival, and SPARK-Friends of Riverbank Park. The park is noted for its burnished-orange boardwalk made from recycled plastic. Building new urban parks and enhancing the availability and value of open space has been a key element of the Christie Administration’s strategy for New Jersey’s cities. Over the past eight years, the Christie Administration has invested $91 million in urban parks throughout the state. The DEP has led the way with its Community Collaborative Initiative, which has assisted Trenton, Perth Amboy, and Camden in the greening of their cities through a multitude of projects. For example, this past September, the DEP announced $7.1 million in grants to Perth Amboy toward a project to convert a former scrap yard into green space to provide residents and visitors public access to the Raritan River. 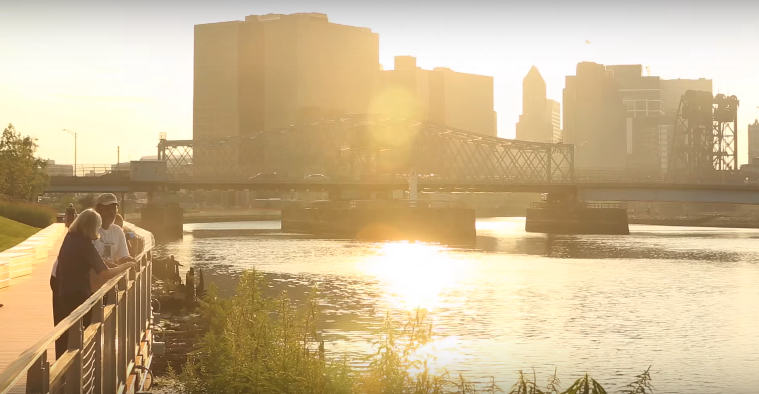 The Christie Administration has placed an emphasis on developing urban parks near the Passaic River as part of its vision to revitalize New Jersey’s Gateway City. Efforts to remediate sediments in the Passaic River that were contaminated by past industrial pollution are moving forward as a partnership between the DEP and the U.S. Environmental Protection Agency (EPA). In partnership with the DEP, the EPA has launched a $1.4 billion remediation of the most heavily polluted area of the lower Passaic River, an 8.3-mile stretch that includes removing 3.5 million cubic yards of contaminated sediments to out-of-state facilities as well as bank-to-bank capping. In addition, the Christie Administration has awarded $53 million in grants secured through NRD settlements to communities within the watershed of the lower Passaic River and the Newark Bay complex to improve public access and restore wetlands ecosystems, reconnecting residents, workers and visitors to these urban waterways. Nearly $18 million of those grants have been awarded to the Riverfront Park project.